Gee Quiz is bringing two and a half hours of Star Wars trivia to The Quadrant for one night only on May the Fourth! Based on the eight official films, the night will be a fun-filled Star Wars-fest with trivia to test even the most avid of fans! In addition to the quiz itself, there will be a range of Star Wars-inspired games and great prizes up for grabs. Kids are more than welcome to come along! Entry cost is $90 (+ B/F) for a team of 4-6 people ($15 per person for a team of six). 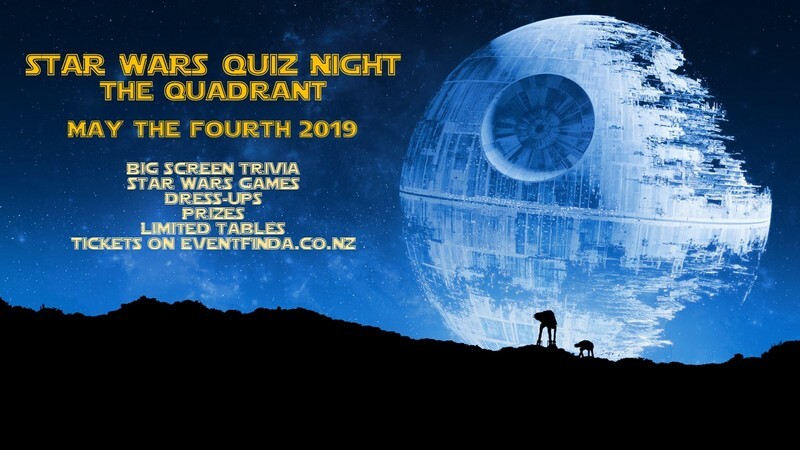 Choose your team wisely as this quiz will bring together the best-Star Wars minds across the city in what will be an epic battle for supremacy. We are limited to 20 tables only, so get in fast! We also have individual tickets for sale, if you go with this option we will match you up with others individuals, pairs and trios to make a full team! *This is an unofficial event by fans, for fans and is not endorsed or associated with Lucasfilm Ltd. Disney, or Twentieth Century Fox and is intended for entertainment purposes only. Star Wars, the Star Wars logo, all names and pictures of Star Wars characters, vehicles and any other Star Wars related items are registered trademarks and/or copyrights of Lucasfilm Ltd., Disney, or Twentieth Century Fox or their respective trademark and copyright holders.